Set of 4 Sturdy Full Color Dry Erase Department of Health Command Boards. The DMS-05583 Command Board Set is an essential companion piece to our DMS-05584 99 Position Department of Health Incident Command Kit and our DMS-05585 29 Position Department of Health Incident Command Kit. These command boar..
All Disaster Management Systems' Command Kits are the only kits that are shipped ready to deploy as soon as you receive them. Not just a bag of vests, every position vest is shipped with position responsibility sheets on clipboards with pens. The NIMS/ICS 29 Position Department of Health Command .. 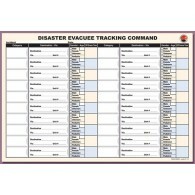 This Evacuee Tracking Kit works in conjunction with all DMS Disaster Evacuation Tags and DMS Special Needs Evacuation Tags to efficiently track victims from incident to intended destination. 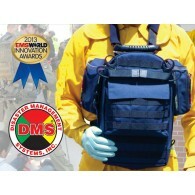 Effectively track evacuees and/or and special needs evacuation victims with the Evacuee Tracking System from ..
Point of Dispensing (POD) High Volume Vaccination/Dispensing Vest & Signage Workflow Kit (replaces DMS-05355 and DMS-05465) The Disaster Management Systems' POD Vaccination/Dispensing Vest and Signage Workflow Kit is a best practices solution for high volume vaccination and/or medication dis..
All Disaster Management Systems' Command Kits are the only kits that are shipped ready to deploy as soon as you receive them. Not just a bag of vests, every position vest is shipped with position responsibility sheets on clipboards with pens. The NIMS/ICS 99 Position Department of Health Command ..
Package pricing when you purchase this refill kit. Refill kit includes: DMS-05506 - Pad of 25 Synthetic Paper Disaster Evacuee Tracking Sheets DMS-05507 - 50 Pack of 2" Adhesive Backed Patient Category Pouches DMS-05508 - 50 Pack of 4" Adhesive Backed Destination Ca..
Destination Login Replacement Pad 5 Sheets per pad. 8.5 X 11.5" Synthetic Waterproof Paper (Enough to document 250 Evacuee instances). 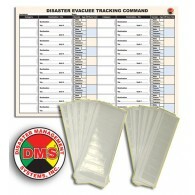 ..
Pad of 25 - Synthetic Paper Command Tracking Sheets Designed for General Disaster Evacuation 17" X 11.5" ..
50 Pack - 2" adhesive backed "Category Receipt" Sleeves ..
50 Pack - 3.5" Adhesive Backed "Destination Receipt" Sleeves ..